Scotland's weather threw everything she had at us today. We just didn't see it coming. We'd already figured out that the wind always blows in Scotland. Always. And from our limited experience, it was always a North wind. 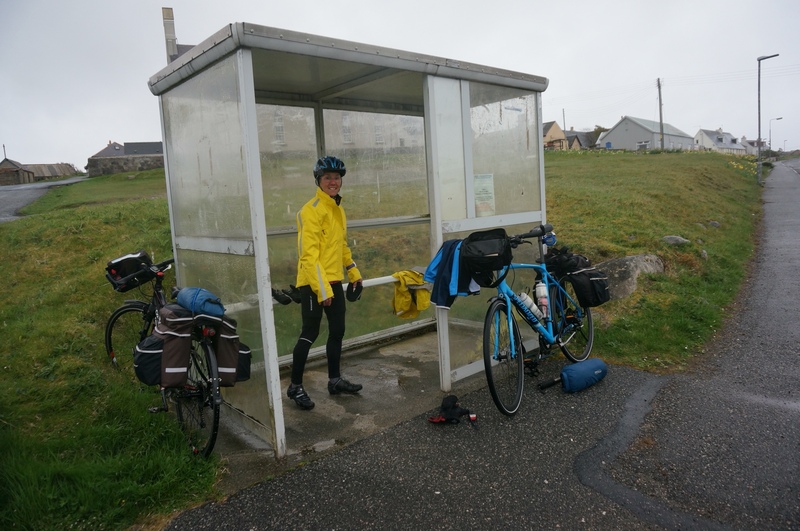 So we thought that cycling south through the Outer Hebrides was a good strategy. With no internet at the hostel, we set out without a current forecast. The skies are their usual drab gray, and we assume the strong gusty wind is out of the North. By the time we reach the main road, reality sets in. Rain is falling and that wind is out of the SE – directly in our faces. Making a pit stop at the local bus shelter, we quickly prepare to do battle. While planning for this cycling trip, I succombed to a bout of paranoia about the weather. A heavy cycling jacket, wind proof gloves and booties to go over my shoes all went on the credit card and arrived by UPS. I added my skull cap and winter tights to the mix as I packed. I haven't regretted a single ounce that they added, and have worn most of these every day. Today I wear them all. And then some. There are no trees on most of the Outer Hebrides. So that wind comes straight off the sea with nothing to stop it or shelter us. As we push on into the wind my head is so low that the brim on my helmet blocks my view of everything but the road directly in front of me. My side mirror is specked with water drops – as are my glasses – and I can just barely make out Rich's hunched yellow form behind me. The wind blows away any words we utter, so we just press on. There are some cool things to see on our route. A round fortress called a broch, with double walls and circular staircase between them to reach the arrow slits for defense. We pass it with barely a glance down the road in the direction of the sign. The island's most dramatic prehistoric ruins, the Callanish standing stones – nearly 50 of them up to 15 feet high. We see them on the hilltop as we head for the visitor center to seek shelter and hot drinks. That's as close as we get. Our original destination is Tarbert, 45 hilly miles to our southeast. Over tea and hot chocolate, under pitying glances from other tourists, we recalculate our plans. Options are few, as the route is mostly unpopulated. And our progress is incredibly slow against the wind. Rich convinces me that the best course is to head to Stornoway, completing the circle we started yesterday. With nine miles under our belts already, that leaves a mere 17 miles to go. Wriggling back into our soggy clothes we set out once again, convincing ourselves that it has let up a little. We're fooling ourselves of course. The rain pelts our faces and the severe wind blows. Fortunately, cycling generates plenty of heat, allowing us to stave off the discomforts of nature for some time. Relief comes within 10 miles, when the route swings north. The quartering tailwind now propels us forward and suddenly we are making rapid progress. Our spirits soar along with our speed. Rain has soaked our gloves and begins to make its way down the back of our necks. I find shifting difficult with my chilled fingers. But the end is in sight. It's not the end we envisioned when we set off this morning, but by now it's the one we are eager to reach. Turning into the first B&B we see, it feels like we have been cycling all day. Yet it is only 1:30. Good thing – our clothes will need plenty of time to dry out. And there is tomorrow to plan. Tarbert still awaits. We hope not to be battling the elements again. Good thing that you have Yooper blood Molly. Sisu means to persevere no matter what in Finlandia. Keep on cycling.